In the last two decades of the twentieth century investors enjoyed an impressive bull run in both equities and bonds. Multi-asset portfolios then were really only bi-asset portfolios, mainly invested in these two major investment asset classes. Why would anyone want to complicate it by adding other assets when those two generated handsome returns while reducing risk through diversification? The investing world was simple back then. The dawn of the twenty-first century brought an abrupt end to these simple days. When the bursting of the technology bubble struck the financial world in 2000, and then again when the 2008 global financial crisis hit markets, the quest for new investment asset classes woke up from its dormant state. Not only did equities disappoint investors, but also the correlation among some assets jumped upwards and the merits of diversification were questioned. Investors sought new engines to enhance returns, new diversifiers to dampen volatility and new types of investment assets to mitigate portfolios’ downside risk. Multi-asset investing, as we know it today, was born. Today, investors have an ample choice among a long list of investment asset classes. Globalisation, technological advantages and financial innovation mean that never before were investors able to cast such a wide net to choose assets for their portfolios. Truly global equities, both public and private; government bonds from across developed and developing countries; corporate bonds issued by investment grade and speculative entities; commodities, ranging from metals in Australia to timber in Canada and everything in between; real estate in London, art in New York, catastrophe bonds in Tokyo; and farmland in Africa. The menu can be mind-boggling, and this is only but a sample. With such a wide spectrum on offer how can investors make sense of this sometimes-confusing choice? What framework can investors use to understand the characteristics and behaviour, and most importantly, the role of each investment asset class within multi-asset portfolios? An intuitive way to think about the characteristics of investment asset classes and understand their behaviour is analysing the risk factors to which assets are exposed. Risk factors are the fundamental building blocks that drive the majority of return and risk of investment assets. Each asset is a bundled exposure to a number of risk factors. Understanding the risk factors allows investors to form a familiarity with the asset and a feeling of how it should behave under different market regimes. I identify 10 risk factors, as well as a special, residual one. This is one proposed list of factors – it is certainly not exhaustive, but it should explain the lion’s share of the performance of most investment asset classes. 1. Real rate. The prevailing interest rates in the market, excluding inflation. Central banks control short-term interest rates, while market forces set long-term rates. Real rate is one of the variables in the discount factor used to calculate the present value of future cash flows that assets generate. Hence, real rate is important in valuing any asset. The price of government bonds with negligible default risk is a function of real rate and inflation as they generate a stream of predictable cash flows. The price of inflation-linked bonds is adjusted for inflation. So their value is a function of real rates. Higher real rates lead to lower price of bonds and vice versa lower real rates lead to higher price of bonds. Interest rate risk reflects change in real rate. Longer maturity bonds have higher interest rate risk than shorter maturity bonds. 2. Inflation rate. The rate of inflation in the market. Inflation is mainly determined by the supply of money and demand for products and services. Together, real rate and inflation rate make the nominal rate. Inflation rate affects the price of most assets whose cash flows are generated over a long time period as inflation can erode their purchasing power. Inflation risk reflects changes in inflation rate. Often, it is not actual real rate and inflation rate that matter, but rather investors’ expectations of real rate and inflation rate. This is where psychology and sentiment take a centre stage. If investors’ perception is that real rate and inflation rate are to drop, they will buy bonds, bidding their price up and yield down. At the end of the day, forces of supply and demand set the prices of investment assets. These forces can be driven by fundamental risk factors, but can also be driven by how investors view the risk factors. 3. Credit spread. The difference between interest rate or yield of investment grade bonds and government bonds. The yield of investment grade bonds is the nominal yield of the reference government bonds plus the credit spread. It reflects the credit risk or risk of default of bonds compared to that of comparable government bonds. High credit risk requires a wide credit spread to compensate investors for the risk and convince them to lend money to the issuer. The price of investment grade corporate bonds is a function of real rate, inflation rate and credit spread. Credit spread is linked to the commercial fortunes of each issuer so it is influenced by the state of the general economy and the idiosyncratic state of the issuer. Therefore, credit spread is similar to equity risk, which is also influenced by similar variables. 4. High yield spread. The difference between interest rate of below investment grade or speculative bonds and government bonds. It reflects the higher risk of default of junk bonds compared to that of comparable government bonds. High yield spread is much more sensitive to the commercial fortunes of the economy and each issuer than credit spread. Therefore, high yield bonds can behave more like equities than like investment grade bonds. 5. Emerging market spread. The difference between interest rate of bonds issued in emerging economies compared to comparable government bonds issued in developed economies. It reflects the risk of default of issuers in emerging economies, as well as different real rate and inflation rate. The first five risk factors explain the majority of performance of fixed income instruments. 6. Developed growth. The economic growth rate of developed economies. It affects the prices of equities in developed markets since equity price reflects the expectations of investors about the future prospects of each issuing company and the general economy. Equity risk reflects changes in developed growth rate. While developed growth is positively linked to the price of equities, it is negatively linked to the price of government bonds. When the economy expands, real rate is expected to rise, as does inflation rate. This has a negative impact on the price of government bonds. For spread products, increasing developed growth can narrow the spread over government bonds while putting negative pressure on the reference government bonds. The direction of price is determined by which of these two opposite forces is stronger. 7. Emerging growth. The economic growth rate of developing economies. It affects the prices of equities in emerging markets. While emerging market equity price is a function of emerging growth, it is also a function of developed growth, explaining the sometimes-high correlation between emerging and developed equities. This link has become stronger over the last two decades as financial markets have become more integrated. 8. Size. The factor that affects the prices of small capitalisation equities. These are normally riskier than their large cap peers. However, small and medium size risks should earn a rewarded for investors. 9. Commodity. The price of commodities. It does not only affect the prices of commodities as a separate investment asset class, but also the performance of equities since commodities are an important input in the operations of companies and sometimes an output of companies. 10. Currency. The fluctuations in exchange rates between currencies. Every foreign investment denominated in a foreign currency comes with a currency risk. Currency risk can have a large impact on performance when measured in the base currency of the investor. 11. Special risk factor. A residual risk that is not captured by the other 10 risk factors. The performance of some investment asset classes, such as real estate, private equity and art cannot be explained only by the other 10 factors. These assets have something special that explains their performance in addition to the other factors. This special risk factor is what makes alternative investments unique since they bring something new to the plate, adding a return that is not covered by those of the traditional investment asset classes of equities and bonds. The 10 factors and the special one explain the performance of most investment asset classes. By understanding the factors and how each asset is exposed to them, investors can truly understand the characteristics, behaviour and correlations of investment asset classes. Investors should remember three lessons from risk factor analysis. First, investment asset classes can have exposure to common risk factors. For example both developed equities and investment grade corporate bonds share an exposure to developed growth. This explains why they are correlated. Investors should ensure that their portfolios are diversified across uncorrelated risk factors to reduce risk, rather than across investment asset classes that might be correlated. Second, the exposure of investment assets to risk factors changes – it is dynamic. Investors should update the risk factor analysis regularly to capture the dynamism in risk exposure. Thirdly and finally, the market compensates risk factors by risk premiums. Equity risk premium, maturity risk premium and credit risk premium are the traditional ones. Size, value, momentum, quality, low-beta and others are the non-traditional ones. Investors should harvest risk premiums and dynamically expose their portfolios to risk factors that they believe should attract the highest risk premium during different states of the economy. The modern way to think about investing is to focus on the outcome that investors seek. The goal of investing is not to beat or match some index that is at best weakly linked to the investment objectives of investors. Rather, the goal should be strongly linked to investors’ needs. I identify four investment outcomes: (1) growth; (2) income; (3) inflation; and (4) liabilities. Growth is, as its name hints, growing the value of investment assets. For example, when an individual saves for retirement the goal could be growing the value of the pension pot by an average of 5% per year. Income, the second outcome, is generating cash flows from investment assets. For example, when the individual reaches retirement the goal could be to generate a yield of 4% from the pension pot. The growth and income outcomes may be combined, as our individual would like to preserve the capital of the pension pot, while spending the income, so the portfolio needs to grow so it can keep generating income for years. Inflation, the third outcome, is maintaining the purchasing power of investment assets over time to battle the erosion from inflation. This is especially important over the long term. Growth can be expressed as real growth so it includes the inflation outcome plus growth above the rate of inflation. Our pensioner may live for many years after retirement so the purchasing power of the pension pot should at least keep pace with inflation. Finally, liabilities outcome is keeping the value of investment assets in line with the value of liabilities. For example, a defined benefit pension scheme has a stream of cash flows that it needs to pay to its members over their lives. Changes in interest rates and inflation can change the value of those liabilities. The scheme can hold some assets whose value should change to match the value of the liabilities to reduce the risk of mismatch between asset and liabilities. These four outcomes encompass the reasons for holding investment assets. With these outcomes in mind, investors can think about the characteristics of investment assets and map their roles in the context of how they match the desired investing outcomes. But it is not only the final outcome that matters to investors, but also the journey. The journey can represent the volatility of the voyage. Volatility of returns is one of the most common measures of investment risk. The journey can also represent whether the outcome is delivered on time or at all. The outcome should be achieved during the investor’s investment horizon; otherwise, it is a failure of delivery or a permanent loss. This is the true risk of investing. Each asset that you own should have a role. You own a car for mobility, you own a house for shelter and you own a television for entertainment. Similarly, each investment asset that you hold in your portfolio should fulfil a legitimate investment role. The roles of investment assets should be either to achieve the investment outcome and/or to improve the journey to achieve the investment outcome. I identify seven legitimate investment roles for investment assets. The first four are aligned with investment outcomes: (1) growth; (2) income; (3) inflation hedging; and (4) hedging liabilities. The last three roles are to improve the journey: (5) diversification; (6) hedging risks; and (7) protecting. 1. Growth is generation of capital appreciation or returns. Equities, for example, come with the hope of appreciation of their value over time and they are the classic growth engines of many portfolios. Within the fixed income space the growth assets are high yield bonds and emerging market debt. These assets can be used as equity-substitutes as they can have potential for capital appreciation and yields that can contribute to total returns. Normally, these assets have lower upside and downside risk compared with those of equities. 2. Income is yield or regular generation of cash flows for distribution. The classic yielding assets are fixed income instruments, such as government bonds and corporate bonds. Cash can also deliver yield. However, in the current low-yield environment cash hardly provides any decent yield. In this environment, investors are pushed to riskier assets with higher yields than cash to satisfy their hunger for income. Real estate and Real Estate Investment Trusts (REITs) are a source of rental income. Many multi-asset income solutions rely on four building blocks to provide yield: investment grade and high yield corporate bonds, emerging market debt, REITs and equities for their dividend yield. 3. Inflation hedging is the preservation of purchasing power over time or generating positive returns when inflation unexpectedly rises. The classic inflation hedging assets are inflation-linked bonds, commodities, real estate and infrastructure. Inflation-linked bonds are designed to adjust their coupons and principal to changes in inflation. The prices of commodities should be linked to inflation and so are the prices of properties and infrastructure assets. 4. Hedging liabilities is immunising against the effect of liabilities. Normally, long-term bonds with a matching maturity to that of the liabilities or derivatives, such as interest rate and inflation swaps, are used to hedge liabilities. Many investors divide their portfolio between growth assets, whose role is growth, and matching assets, whose role is hedging liabilities. 5. Diversification benefits come with low correlation with other assets. In particular, investors seek assets with low correlation with equities, which make up the bulk of most portfolios. Diversification reduces the overall risk of the portfolio. Classic diversifying assets are government bonds, which should have low correlation with equities since risk factors that affect equities favourably should affect government bonds negatively, and vice versa. For example, strong economic growth should lift the value of equities but put downward pressure on bonds since interest rates and inflation are expected to rise. Other diversifying assets are alternative investments, such as commodities, real estate and some hedge funds, in particular market neutral. The performance of these assets is driven by special risk factors different than those driving the returns of equities. Unique risk factors increase the probability of lower correlation. 6. Hedging risks is removing the exposure to a risk without incurring the transaction costs and time to sell it. Most assets in this category are derivatives that are used to take the opposite position to the risk or exposure that needs to be hedged. 7. Protecting is generating positive returns when risk asset fall to offset some of the negative effect or generating positive returns during flights to quality. Government bonds, the US dollar and long volatility are examples of protective assets. Considering the outcome and the journey, one classification of investment assets is a separation into risk and conservative assets. Risk assets come with volatility of returns, a potential for a severe drop in value and risk of a permanent loss. This does not sound very good – it sounds risky. But risk assets also come with a reward. Financial markets incentivise investors to assume investment risks, as higher risks should attract higher returns. So the main characteristic of risk assets is the generation of growth. The growth can be volatile. But for those who can stomach fluctuations in an assets’ price, higher returns can be the reward. However, the returns might be negative. Typical risk assets include public and private equities, high yield bonds, emerging markets debt, and commodities. One feature these assets have in common is potential returns with volatile prices. Conservative or safe-haven assets come with lower volatility of returns compared to risk assets; the potential of severe drop in value is lower, as well as the risk of permanent loss. The main features of conservative assets are that they tend to maintain their value in nominal terms (mind you, nominal does not mean real or after inflation) and they normally generate a steady stream of cash flows. So the main characteristic of conservative assets is the generation of income. The income is normally steady, notwithstanding default. This does not mean that conservative assets cannot generate growth or capital appreciation or depreciation. But their growth is not as high or low as that of risk assets. Conservative assets include government bonds, investment grade corporate bonds, and real estate. The financial world is dynamic – nothing is stationary. Conservative assets can change their fundamental characteristics and turn into risk assets. For example, the investment grade bonds issued by Lehman Brothers lost all their value in 2008 and the safe-haven status of sovereign bonds issued by the government of Greece turned into junk in 2011. Investors need to monitor the dynamic characteristics of assets and classify them according to current conditions. The separation between outcomes and risk and conservative assets is not always clear-cut. Equities, for example, generate growth, as well as income in the form of dividend yields. Investors should not rigidly classify an asset into a bucket without considering its characteristics across the four outcomes. Another classification of investment assets is that of real assets. This is not the separation between tangible real assets and intangible financial assets that source their value from contractual terms. Here, real assets are those whose value should keep up with inflation over time. The values and returns of inflation-linked bonds, commodities, real estate and infrastructure should fair favourably in inflationary regimes. So the main characteristic of real assets is hedging inflation. Finally, when liabilities are thrown into the mix of asset management, the characteristics of assets should be evaluated relative to those of the liabilities. Here investors should look for matching assets. When liabilities are spread over the next 10 years, for instance, government bonds with a matching maturity of 10 years can be conservative assets. Their value should match that of the liabilities when interest rates fluctuate. Cash is a risk asset when considering liabilities since its value will not match that of the long-term liabilities. The three main risks of liabilities that investors normally seek to hedge are interest rate, credit and inflation. So assets with matching but opposing risk to those of liabilities have the properties to hedge liabilities. Here the characteristics of the assets are defined by the specific liabilities. The proposed framework is therefore to think about the characteristics of each investment asset relative to the outcomes that investors are seeking. These characteristics are dynamic and specific to the individual circumstances of each investor and conditions. 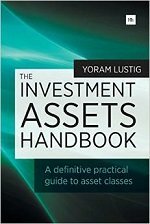 Yoram Lustig is Head of Multi-Asset Investments UK at AXA Investment Managers and author of Multi-Asset Investing and The Investment Assets Handbook, both published by Harriman House. Free Trading research and Analysis Tools - One of the worlds largest financial trading resources websites with a very wide range of free trading research and analysis tools for private investors. Free streaming news feed, detailed quotes, create free portfolios, charting tools, company news and dividend information.